Cinnabon wants to wish you “Bon Voyage”! Visit cinnabon.com/bonvoyagesweeps and find out how you can enter this Sweepstakes for a chance to win 100,000 air miles for your own sweet escape plus FREE Cinnabon for a year. 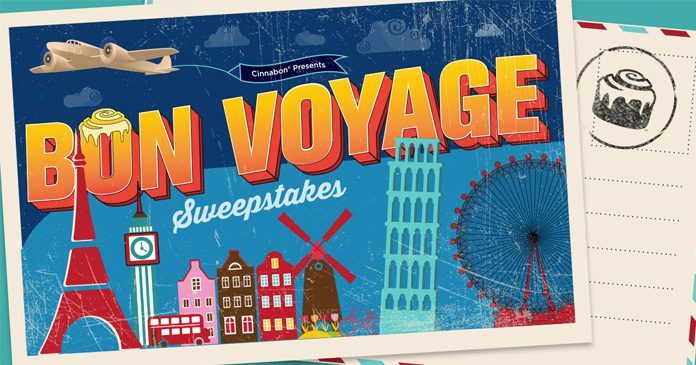 Cinnabon Bon Voyage Sweepstakes is only open to legal residents of the United States and the District of Columbia (excluding residents of Puerto Rico and US territories and possessions). You must be at least 18 years of age or older at time of entry. The Promotion commences at 12:01 AM ET on September 18, 2017, and ends at 11:59 PM ET on November 12, 2017. One post is equal to one Entry. Share multiple times for multiple entries. During the Promotion, there will be one winner randomly selected from all eligible Entries. Potential Winner will be chosen and notified by Sponsor through the email listed on Winner’s Entry form or through Winner’s Club Cinnabon account on or before November 20, 2017. Total ARV for all Promotion Prizes is $3,535.88. For a list of Winners, send a self-addressed stamped envelope to: Cinnabon Franchisor SPV LLC “BonVoyage Sweepstakes, Attn: M. Greene, 5620 Glenridge Drive NE, Atlanta, Georgia 30342. The Promotion is sponsored by Cinnabon Franchisor SPV LLC.